Friday night was one of those "good news, bad news" as several of the New York Ranger and New York Islander prospects played solid games while others just did not. It was an interesting evening highlighted by a prospect who has been on a tear lately and another who reached the 20 goal mark. Nothing warms my heart more than seeing a team captain pick up his team and carry them himself like Ryan Pulock (NYI 2013 1st) has been doing lately. Pulock with a 1-2-3 evening earned him the game's first star as he led his Brandon Wheat Kings to a convincing 6-2 win over the Saskatoon Blades. It was more than the offense as Pulock and his teammates held the Blades to just 19 shots for the game and really played a beauty of a game (taking just 1 penalty) in winning their 3rd straight game. Pulock is on a 5 game scoring streak (3-6-9 all 3 goals are power play ones) and got his night going with his 8th goal of the season at 10:31 of the first period which was Brandon's 2nd goal of the game. In the 2nd period after Saskatoon had closed the lead to 2-1, Pulock set up Tim McGauley for Brandon's 3rd goal of the game (which proved to be the game winner). Saskatoon did not want to go away as they scored to close the score to 3-2 when Pulock went back to work. Pulock set up Peter Quenneville for a power play goal that made the score 4-2 and Saskatoon never threatened again. Pulock has taken over the Islander prospect scoring lead with a 8-13-21 mark. Last season in 55 games Anthony Duclair (NYR 2013 3rd) had 20 goals in 55 games which is a big reason why Duclair fell to the 3rd round. After 23 games this season Duclair now has 21 goals thanks to the 2 goals he scored to help his Quebec Remparts earn a 4-0 win over the Shawinigan Cataractes. Duclair is a big reason why his Remparts are unbeaten in their last 4 games and 6-3-0-1 in their last 10. 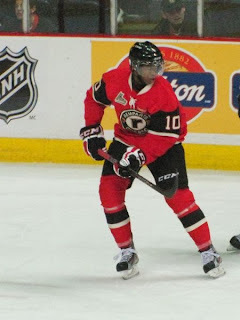 Duclair scored the 3rd and 4th goals for the Remparts with both scored at even strength and part of a 2-0-2 +2 on 3 shot night for the left winger from Montreal. Duclair is now 21-10-31 which is good for 10th overall in the QMJHL scoring race. Eamon McAdam (NYI 2013 3rd) was making just his 3rd start of the season and it was against the 13th ranked UMass-Lowell Riverhawks. Yes his Penn State Nittnay Lions lost 3-2 but McAdam played a solid game stopping 41 out of the 44 shots he faced. He played with more confidence than his other 2 starts and the "deer in the headlights" look was gone. McAdam still needs work to get better but this was the first real positive effort seen from him this season. Loic Leduc (NYI 2012 4th) has been another player who just did not seem to "get it." Here is a 6'6 defender who doesn't always use his body to his advantage. But every once in a while the light switch would go on and so would his physical game. Leduc's Cape Breton Screaming Eagles dropped a 3-0 decision to the Rimouski Oceanic but Leduc played a strong game recording a season high 5 hits in the game and disrupting Rimouski's attack on his side of the ice. Boy if Leduc would bring this kind of effort every night then there is no telling just how good he could become. One part of the bad news was that Steven Fogarty (NYR 2011 3rd) had to leave his 4th ranked Notre Dame's game against the Merrimack Warriors with an injury. Early in the 2nd period, Fogarty took a really hard hit into the boards and appeared to hit his hip against the the door jam. He left the ice in obvious pain and did not return. Notre Dame coach Jim Jackson said after the game that he was not sure if Fogarty would be able to play Saturday night. As for the game, Notre Dame was able to shut out Merrimack 4-0 as injuries played a big part for both teams in this game. Both teams started the game missing key players and added to the injury list as the game went on. Robbie Russo (NYI 2011 4th) didn't score but he was active at both ends of the ice playing a physical game that he isn't exactly known for. On offense, Russo led the Irish with 5 shots on goal and was a +3. That is also the kid of effort Russo needs if he wants an Islander contract. In Minnesota the top ranked Minnesota Golden Gophers played host to in-state rival Minnesota State and this game had a first for us as Brady Skjei (NYR 2012 1st) was paired with Jake Bischoff (NYI 2012 7th) on defense. For Bischoff, it was a promotion to 2nd pair defense after just being a part time player. For Skjei, it was the coaching staff entrusting another offensive minded defenseman to Skjei to cover up his liabilities. Of course that means that it was Brady Skjei who scored as he had a secondary assist on Minnesota's 1st goal of the game. Skjei is 1-2-3 on the season with the point and the 3rd prospect playing for Minnesota Taylor Cammarata (NYI 2013 3rd) did not score either. On Minnesota State, goalie Stephon Williams (NYI 2013 4th) was the back up for his team. Cristoval Nieves (NYR 2012 2nd) had a secondary assist but his 2nd ranked Michigan Wolverines lost to Nebraska-Omaha 3-2. Nieves had his assist on Michigan's 1st goal for his 1st point in 4 games as he improves to 1-4-5. Nieves needs to become more active on the ice as his team is very offensively challenged that they need Nieves and his offensive game to get going. 1 shot a game is just unacceptable. Adam Pelech (NYI 2012 3rd) and Troy Donnay (NYR 2013 UFA) were both scoreless as their Erie Otters won their 4th straight game with a 3-0 shutout of the Saulte Ste. Marie Greyhounds. Solid job on defense holding the Greyhounds to just 18 shots as the team with the best record in the OHL keeps winning. Victor Crus-Rydberg (NYI 2013 5th) and his Plymouth Whalers extended their unbeaten streak to 3 games after a 2-1 shootout win over the Mississauga Steelheads. Crus-Rydberg was scoreless as the Whaler's starting center also missed on his shootout attempt. Ryan Graves (NYR 2013 4th) was scoreless on 3 shots as his Charlottetown Islanders lost 4-3 to the Halifax Mooseheads. There is not much to say about the Islanders as they have gone 2-6-1-1 in their last 10 games. Doyle Somerby (NYI 2012 5th) was scoreless and a -2 as his Boston University Terriers were spanked by the Black Bears of Maine 7-0. Not much one can say about this kind of loss except burn the tape. Adam Tambellini (NYR 2013 3rd) returned to the 14th ranked North Dakota lineup after missing the last 2 games with an undisclosed injury. Tambellini was used as the 4th line center and was scoreless as North Dakota gave away a 2 goal lead before earning a 4-2 win over Minnesota-Duluth. It wasn't pretty but it was a win. 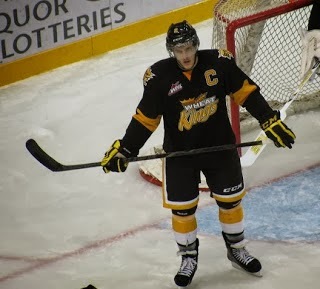 Kyle Burroughs (NYI 2013 7th) missed his Regina Pat's game against the Tri-City Americans with a "upper body" injury. Call his status day to day.